D'Addario makes great cello strings and they are probably the most affordable strings on the market now. (Especially with our prices!) 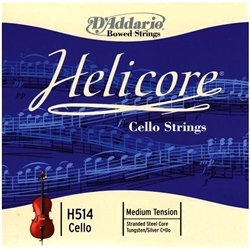 We offer their Helicore, Prelude and Kaplan D & A strings. The Helicores are great cello strings for the dollar. Many professional cello players use these stings and some prefer the low C and G strings.